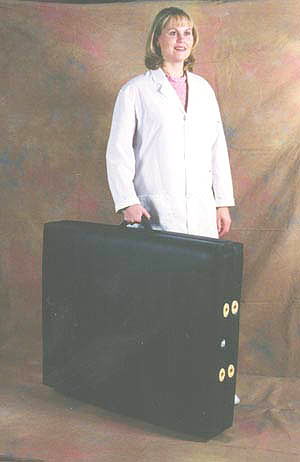 VibraSound® Transportable Massage TableThe VibraSound Transportable is a high-quality massage table constructed from the finest materials available. Totally portable, it can be easily set-up, folded, transported or stored when not in use. The professional rich, black covering is beautiful and durable. 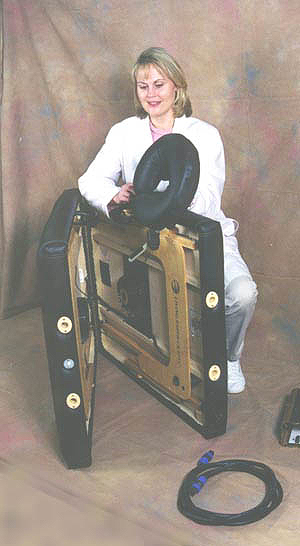 Three layers of various density of foam and wide 32″ frame provides the ultimate in luxurious comfort and support. Attention to detail of the fittings limits noise due to vibration. Two transducers are mounted by a proprietary method that insures that the majority of the vibration enters the entire frame and is no limited to the area around surrounding them. 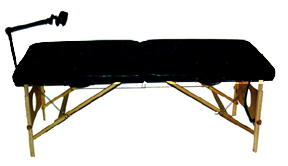 Dual center rails enhance this transfer of vibration and give extra support to the table such that it can handle both client and therapist. This mounting method distributes the signal evenly around and inside the table with the purest, yet quietest, vibration possible. There is no need for sound proofing the room with this table. Simply connect your smart phone or pad, computer, stereo system or audio mixing station to the the included amplifier to begin the experience. 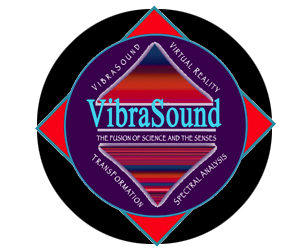 The VibraSound Transportable was designed to work in tandem with the Sensorium LSV II Sensory Interface and Vibrational Therapy System. In addition, various optional peripheral devices can enhance the experience. 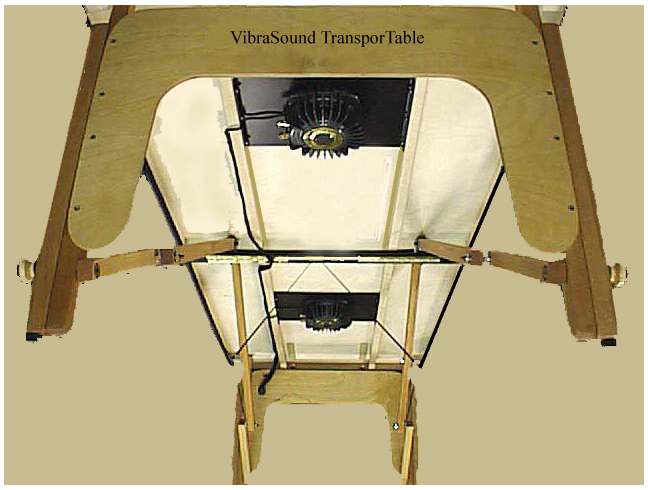 The VibraSound Music Dolphin, Hand and Foot transducer kits, the Portacle and Psi-Fidelity Sound can also be used in conjunction with this table. Comes boxed with the folded table, mounted transducers and cabling to professional connector, twelve foot cable, amplifier and operation manual.